the air passage extending from the throat and larynx to the main bronchi; it is about 1.5 cm (0.6 in) wide and 10 cm (4 in) long and is reinforced at the front and sides by a series of C-shaped rings of cartilage that keep the passage uniformly open. The gaps between the rings are bridged by strong fibroelastic membranes. The trachea is lined with mucous membrane covered with small hairlike processes called cilia that continuously sweep foreign material out of the breathing passages toward the mouth, a process retarded by cold but speeded by heat. Called also windpipe. adj., adj tra´cheal. Although the trachea is closed off by the lidlike epiglottis during swallowing, a foreign body such as a piece of meat occasionally becomes lodged in the trachea and causes choking. If a heimlich maneuver does not succeed in dislodging the foreign body, emergency tracheostomy (surgical incision of the trachea) may be necessary. Another reason for tracheostomy is in order to insert a tube for passage of air when the trachea is obstructed by swelling due to infection or allergic reaction, by accumulation of tracheobronchial secretions, or by a growth such as a polyp or tumor. The air tube extending from the larynx into the thorax to the level of the fifth or sixth thoracic vertebra where it bifurcates into the right and left bronchi. The trachea is composed of 16-20 incomplete rings of hyaline cartilage connected by a membrane (anular ligament); posteriorly, the rings are deficient for one fifth to one third of their circumference, the interval forming the membranous wall being closed by a fibrous membrane containing smooth muscular fibers. Internally, the mucosa is composed of a pseudostratified ciliated columnar epithelium with mucous goblet cells; numerous small mixed mucous and serous glands occur, the ducts of which open to the surface of the epithelium. 1. Anatomy A thin-walled, cartilaginous tube descending from the larynx to the bronchi and carrying air to the lungs. Also called windpipe. 2. Zoology One of the internal respiratory tubes of insects and some other terrestrial arthropods, which are connected to the spiracles and are used for gas exchange. a nearly cylindric tube in the neck, composed of C-shaped cartilage and membrane and trachealis muscle, that extends from the larynx at the level of the sixth cervical vertebra to the fifth thoracic vertebra, where it divides into two bronchi. The trachea conveys air to the lungs. It is about 11 cm long and 2 cm wide. The ventral surface of the tube is covered in the neck by the isthmus of the thyroid gland and various other structures, such as the sternothyroideus and the sternohyoideus. Dorsally the trachea is in contact with the esophagus. Also called windpipe. See also primary bronchus. tracheal, adj. The tubular structure which connects the larynx to the primary bronchi. In non-smokers, it is covered by pseudostratified ciliated columnar epithelium, that transfers particulates out of the bronchi and bronchioles, aided by secretions from mucus-producing goblet cells. The air tube extending from the larynx into the thorax (level of the fifth or sixth thoracic vertebra), where it bifurcates into the right and left main bronchi. The trachea is composed of 16-20 rings of hyaline cartilage connected by a membrane (anular ligament); posteriorly, the rings are deficient for one fifth to one third of their circumference, the interval forming the membranous wall being closed by a fibrous membrane containing smooth muscular fibers. Internally, the mucosa is composed of a pseudostratified ciliated columnar epithelium with mucous goblet cells; numerous small mixed mucous and serous glands occur, the ducts of which open to the surface of the epithelium. The windpipe. A cylindrical tube of mucous membrane and muscle reinforced by rings of CARTILAGE, that extends downwards into the chest from the bottom of the LARYNX for about 10 cm. 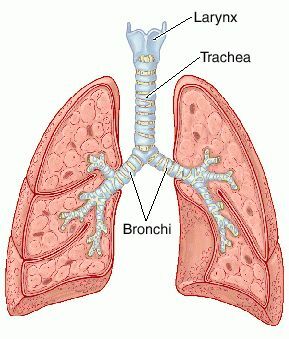 The trachea terminates when it branches into two main bronchi. (in vertebrates; also called windpipe) the main tube leading from the glottis in the neck to the point where the bronchia branch to the lungs. It consists of a fibrous pipe supported by C-shaped cartilage rings to prevent collapse when the head is turned. (in insects) a series of TRACHEOLES by which air is conducted into the body from external openings called spiracles. See also TRACHEAL GILL. (in plants) see XYLEM VESSEL. an empty tube formed from the longitudinal fusion of several cells with strong walls reinforced with LIGNIN, whose function is the mass transport of water for TRANSPIRATION. Vessels are aggregated into XYLEM tissue within the VASCULAR BUNDLES of ANGIOSPERMS. The tube that leads from the larynx or voice box to two major air passages that bring oxygen to each lung. The trachea is sometimes called the windpipe. Air tube extending from larynx into thorax to level of the fifth or sixth thoracic vertebra where it bifurcates into right and left bronchi. n the windpipe; a cartilaginous and membranous tube extending from the lower end of the larynx to its division into two bronchi. the air passage extending from the larynx to the main bronchi; called also the windpipe. This tube is reinforced by a series of C-shaped rings of cartilage that keep the passage uniformly open. The gaps between the rings are bridged by strong fibroelastic membranes. The arms of the C are bridged by the tracheal muscle which can vary the luminal diameter. The trachea is lined with mucous membrane bearing cilia that continously sweep foreign material out of the breathing passages toward the mouth. The conductive portion of the boto and tucuxi respiratory tract consists of the trachea, tracheal bronchus, right and left main bronchi and secondary bronchi, all of which have incomplete cartilaginous rings with a rounded shape (Fig. The trachea is a tube that begins in the larynx and ends in the tracheal bifurcation of the main bronchi. The trachea of the analyzed boto and tucuxis also demonstrated trabecular surface pattern, a result compatible with Reidenberg & Laitman (2014), who concluded that such a tracheal pattern in these animals facilitates the contraction of volume, since this portion of the tracheal wall is flexible. During the 3-month follow-up, X-ray investigation showed that the artificial trachea had become a part of the recipient's trachea in good position, and its diameter was almost equivalent to the native trachea. Later, trachea lumen above the tracheotomy closed from granulation [Figure 1]c that resulted in a lost voice. Primary anastomosis of trachea after resection of a long-segment around 6 cm is extremely difficult. 2) Computed tomography (CT) images were obtained to accurately measure the strictured areas of the tracheal lumen as well as the maximum diameter of the healthy trachea cranial and caudal to these areas. This customized stent was manufactured to be 10% oversized, self-expanding, and equivalent to the maximum diameter of the healthy-appearing areas of trachea cranial and caudal to the strictured area. Tracheoscopy revealed thick, yellowish, mucoid exudate lining the trachea cranial to the stent and extending down the tracheal wall. 3) Effect of Kidsolone on electrically induced contractions - electrical stimulation of this tissue causes parasympathetic nerve remnants in the trachea to release the transmitter acetylcholine. Because no suitable donor windpipe was available, the transplantation of the synthetic tissue engineered trachea was performed as the last possible option for the patient, referred by Prof.